Can Sewells Improve your Business Performance? …. The answer is YES! Now, what outcomes do you want to see? Whether you’re looking to eradicate team team dysfunction, achieve amazing levels of customer service or find the secret to making more profitable sales …. the business improvement you’re looking for is very much within your reach. We provide the best-designed, most reliable business improvement solutions at competitive value for money prices. Our track record in terms of improved results and customer endorsements is second to none. 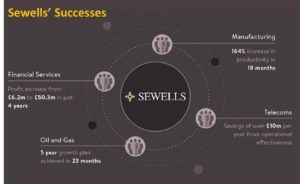 Click here to take a look at Sewells’ most popular business improvement services, the ones our customers value the most. Whatever the business improvement YOU want to see, SEWELLS has the ability to bespoke a structured programme to exceed all your expectations. We know this because we’ve been doing this for over 54 years and we’ve never failed to exceed pre-agreed improvement objectives … EVER! Don’t you think it’s time your organisation experienced the business growth you’ve been searching for? Simply get in touch on tellmemore@sewells.com to arrange a free, no-obligation strategy session and let Sewells take your business to the next level.